PINK, PINK, PINK!!! IT NOW COMES IN PINK!! Enter to win the best classroom, home, office, or traveling pencil sharpener ever! It will always leave your pencils sharp! Please check out these amazing sharpeners at http://www.classroomfriendlysupplies.com/. If you have one, you will want another. If you have two, I'm sure three is not too many. If you really want a chance to win, please enter the giveaway! It is so easy! I might even enter myself!! My the force be with you, no I mean me. My current manual sharpener in class doesn't work. Every school-provided one has died within a month! I have electric sharpeners, but third graders still have trouble not pushing the pencil in so hard that it overheats the mechanism. We had 3 burn out in 1 day last year! I'd LOVE to have a sharpener that works as well as everyone says this one does...and QUIET to boot! You can't beat that! I so hope you win!!! It truly is a wonderful sharpener! 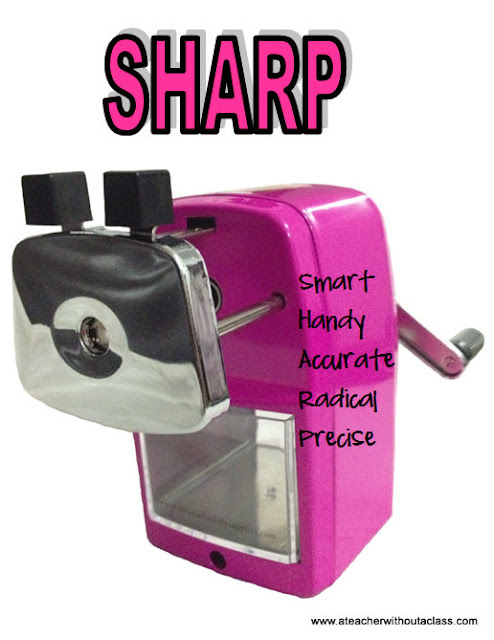 I want this sharpener because its my favorite color and I've been waiting for it to come out in pink! Thanks for the giveaway! Of course I SO want this sharpener! I have one already and my students fight over it! I would love another one...in pink too! My son's 4th grade class doesn't have a sharpener that works so I'm trying to win one to give to his teacher. They have to use their own little plastic sharpeners. I have an old electric sharpener that is SO LOUD! I don't let the kids sharpen pencils during the school day because it is so distracting! I teach violin, and this would totally come in handy during lessons! All I have is little handheld pencil sharpeners and they don't sharpen well at all! Last year my Kindergarteners broke my electric sharpener (that didn't work that well anyway) and I had to borrow a sharpener from the teacher next door. I hate my pencil sharpener because the handle will not stay on. It is also very noisy and doesn't sharpen the pencils very well! I had a sharpener that didn't work all year. The kids had to use personal sharpeners and it was a mess. I don't want to go back to that. I really need a new sharpener. I teach two groups of 21 4th graders and I do all the sharpening at home because the students have a hard time with my current crank sharpener. Love the opportunity to get a new sharpener. Ours constantly breaks the tips off inside and they are nearly impossible to remove. I need a reliable sharpener in my room. And the pink one is sooo pretty!! This pencil sharpener is awesome!!!! I really want one for my classroom. According to pencils.com "a pencil can write 45,000 words" thus the need for a beautiful pink pencil sharpener in my classroom! Thanks! I would love to win because I keep running across other reviews about how awesome it is! I need an awesome pencil sharpener. I keep seeing such rave reviews for this pencil sharpener! I would love to try one myself!! I really love this pencil sharpener. I teach first graders, I sharpen lots of pencils everyday, I really need one! This would've been lovely for me if I knew about the giveaway earlier. I owned one of these and it lasted for years! I still have it til now so that's a good review about durability. عندما تحصل على أثاث مثل خزائن أو أسرّة أو أرائك لمنزلك ، فأنت ترغب في الحصول على أثاث قوي ومتين يدوم لسنوات قادمة. أثاث ذو نوعية جيدة يمكن أن تكون ثقيلة إلى حد ما. وعندما يتم تسليم الأثاث إلى منزلك ، من المتجر الذي اشتريته ، لا داعي للقلق بشأن الرفع الثقيل. حتى أنهم يقومون بتجميعها لك ووضعها في المكان الذي تريد أن تذهب إليه.